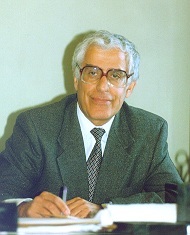 Professor, Dr. Of Science, Karakhanov Eduard A. Academic education: M.Sci., Department of Chemistry Moscow State University (1960); Ph.D. (Chemistry) (1963), Doctor of Science (Chemistry, 1977), Professor of Chemistry (1981) Moscow State University, . Since 1983 up to date. Head of the chair of Petrochemistry and Organic catalysis, Department of Chemistry, Moscow State University. Prof. E.Karakhanov leads a large research group specialising in research in the field petrochemistry, biphasic and enviromentaly friendly homogeneous catalysis, heterogeneous catalysis, immobilised metal complexes, green chemistry, supramolecular chemistry, design of hybrid materials. Karakhanov, A. Maximov, P. Poloznicova, K. Suslov, Two-phase catalytic oxidation by Macromolecule-Metal complexes. Studies in Surface Science and Catalysis, V.121, Science and Technology in Catalysis 1998. P.127. E.A. Karakhanov, A.L. Maximov, V.V. Predeina, T.Yu. Filippova, A.Ya. Restakyan, Two phase Wacker oxidation of alkenes catalyzed by water-soluble macromolecular complexes of palladium. Macromol. Symp. 1998. V. 131.P. 87. E.A. Karakhanov, A.L. Maximov, V.V. Predeina, T.Yu. Filippova, S.A. Martynova, I.N. Topchieva, New catalytic systems for selective oxidation of aromatic compounds by hydrogen peroxide Catal. Today 1998. V. 44. P.189. E.A. Karakhanov, A. Ya. Zhuchkova, T. Yu. Filippova, and A. L. Maksimov. Supramolecular Cyclodextrin-Based Catalyst Systems in Wacker Oxidation. Petroleum Chemistry, Vol. 43, No. 4, 2003, pp. 273–277. Translated from Neftekhimiya, Vol. 43, No. 4, 2003, pp. 302–307. A.L.Maksimov, T. S. Buchneva, and E. A. Karakhanov, Oxidation of Olefins to Ketones Catalyzed by a Water-Soluble Palladium Complex with Calixarene Modified with Benzonitrile GroupsЮ Petroleum Chemistry, Vol. 43, No. 3, 2003, pp. 154–158. Translated from Neftekhimiya, Vol. 43, No. 3, 2003, pp. 173–178. E. A. Karakhanov, A. L. Maksimov, A. Ya. Zhuchkova, T. Yu. Filippova, and L. M. Karapetyan Molecular Imprinting as a Method for the Creation of Cyclodextrin-Based Supramolecular Catalysts Used in the Wacker Oxidation of Unsaturated Compounds Petroleum Chemistry, Vol. 45, No. 2, 2005, pp. 79–86. Translated from Neftekhimiya, Vol. 45, No. 2, 2005, pp. 97–104. 2. S. V. Lysenko, S. V. Baranova, A. V. Sungurov, N. F. Kovaleva, and E. A. Karakhanov. n-Butane Isomerization on Bifunctional Catalysts Based on Tungstate-Modified Mesoporous Zirconia //Petroleum Chemistry, 2005. V.45, No5, p. 305-308. 3. Ivanov A.V., Lysenko S.V., Baranova S.V., Sungurov A.V., Zangelov T.N., Karakhanov E.A. Thermally stable materials based on mesostructured sulfated zirconia //Microporous and mesoporous materials. 2006. V.91. p.254-260. The use of a mixture of vacuum gas oil with residual as catalytic cracking feedstock enable the degree of processing crude oil to be increased considerably. The main problem arises of poisoning of the zeolite-containing catalysis. This problem is solved by using passivators. Our aim consist in the synthesis of new passivators for catalytic cracking and deep catalytic cracking. We are intersted in the development of new catalyst for petrochemistry using mesoporous metal oxides. The objective is to synthesize and thoroughly characterize such materials and to test them for stability and catalytic performance in a number of reaction: hydroisomerization of butane, pentane-hexane and diessel oil, heavy fuel oil, alkylation and hydrocracking of vacuum gas oil. Over the last decade, homogeneous catalysis with transition metal complexes has led to revolutionary new synthetic possibilities not only on a laboratory scale, but has also established itself in many different technical applications. Efficient homogeneous catalysts are nowadays known in virtually all areas of synthesis, from bulk chemicals and commodities, through fine chemicals and pharmaceuticals, to polymers and specialist materials The focus of our investigation is on concepts of self-assembly, non-covalent interactions, host-guest chemistry, and structural templates. Our long-term goal is the development of methods for the design of selective catalyst for oxydation, hydrogenation hydroformylation, carbonylation, epoxidation using host molecules – cyclodextrins and calixarenes. Modified water-soluble macrocyclic receptors can form complexes of inclusion "host-guest" with nonpolar substrates due to a hydrophobicity of internal cavity. The reaction of these catalysts is based on the substrate binding to both the metal site and the receptor cavity, which can influence the selectivity and the pathway of the reaction. The metal ion coordinated to a ligand group bound to cyclodextrin or to calixarene can enhance the stability of the emerging inclusion complexes by the metal ion coordination with substrate. It can also stabilize the transition state, and ensure a high selectivity of the reaction owing to a specific orientation of a substrate. Moreover, as a consequence of the formation of the host–guest complexes, some parts of the molecule are accessible to be attacked by active species, whereas the other are blocked, which can change the selectivity of the reaction. 2. E.Karakhanov, A. Maximov, P. Poloznicova, K. Suslov, Two-phase catalytic oxidation by Macromolecule-Metal complexes. Studies in Surface Science and Catalysis, V.121, Science and Technology in Catalysis 1998. P.127. 3. E.A. Karakhanov, A.L. Maximov, V.V. Predeina, T.Yu. Filippova, S.A. Martynova, I.N. Topchieva, New catalytic systems for selective oxidation of aromatic compounds by hydrogen peroxide Catal. Today 1998. V. 44. P.189. 8. E.A. Karakhanov, A. Ya. Zhuchkova, T. Yu. Filippova, and A. L. Maksimov. Supramolecular Cyclodextrin-Based Catalyst Systems in Wacker Oxidation. Petroleum Chemistry, Vol. 43, No. 4, 2003, pp. 273–277. Translated from Neftekhimiya, Vol. 43, No. 4, 2003, pp. 302–307. 9. A.L.Maksimov, T. S. Buchneva, and E. A. Karakhanov, Oxidation of Olefins to Ketones Catalyzed by a Water-Soluble Palladium Complex with Calixarene Modified with Benzonitrile GroupsЮ Petroleum Chemistry, Vol. 43, No. 3, 2003, pp. 154–158. Translated from Neftekhimiya, Vol. 43, No. 3, 2003, pp. 173–178. Also we used molecular imprinting aproach for design of selective catalyst based on cyclodextrins for Wacker-oxidation of unsaturated compounds. 1. E. A. Karakhanov, A. L. Maksimov, A. Ya. Zhuchkova, T. Yu. Filippova, and L. M. Karapetyan Molecular Imprinting as a Method for the Creation of Cyclodextrin-Based Supramolecular Catalysts Used in the Wacker Oxidation of Unsaturated Compounds Petroleum Chemistry, Vol. 45, No. 2, 2005, pp. 79–86. Translated from Neftekhimiya, Vol. 45, No. 2, 2005, pp. 97–104. This line of research is devoted to the use of biphasic liquid/liquid mixture for catalysis separation from products and for catalysis recovery. These systems contain two phases and catalyst recycling can be achieved via phase separation and re-use of the catalyst-containing phase. One of the promising trends in creating recyclable catalysts is the use of supramolecular stuctures based on cyclodextrines, calixarenes, various polymers etc. We design catalysts that combine properties of metal complexes and a surface active substance with the ability of molecular recognition in water or ionic liquids. Our research interests here are focussed on immobilization of metal complexes on soluble polymer support and dendrimers. The research activities pursued are aimed at improving the use of environmentally compatible raw materials by catalytic syntheses and increasing their economic efficiency. The immobilization of catalysts and implementation of new concepts of multi-phase catalysis shall allow for the best possible use of catalysts. Based on fundamental research results and the developments of applied research, applications shall be opened up in industrially relevant synthesis processes. 1. Karakhanov E.A., Runova E.A., Berezkin G.V., Neimerovets E.B.. Macromolecular Simposia. 1994. V.8. N3. P.231. 3. E.A. Karakhanov, A.L. Maximov, V.V. Predeina, T.Yu. Filippova, A.Ya. Restakyan, Two phase Wacker oxidation of alkenes catalyzed by water-soluble macromolecular complexes of palladium. Macromol. Symp. 1998. V. 131.P. 87. The objective consists in combining synthesis potential of carbon dioxide with reactive intermediate products of petrochemical origin and to make this combination potentially usable in industry. In the sense of a “green chemistry”, for instance, it is aimed at substituting the extremely toxic phosgene by carbon dioxide as reactive C1 synthesis building block. We have succeeded in design of new homogenious catalytic system based on polyethylenoxide Rh and Ru complexes for hydrogenation of CO2 to formic acid. Catalysts were microencapsulated in hybrid material based on polyethyleneoxide and were used repeatedly without activity decrease. 2. S.V. Egazar’yants, E. A. Karakhanov, S. V. Kardashev, A. L. Maksimov, and S. S. Minos’yants, Hydrogenation of CO2 on the Ru macrocomplexes under mild conditions. Petroleum Chemistry, Vol. 42, No. 6, 2002, P.414-417 (Translated from Neftekhimiya, 2002. Vol. 42. No6.P.463-466).